Welcome back to Crafty Chat – a weekly conversation with papercrafting friends on the subjects they know best. Today’s guest is Debby Hughes of Limedoodle Design, and our topic is showing your papercrafting projects in the perfect light with the right photography and backdrop. Debby is a Stamp Artist with Simon Says Stamp, a regular contributing instructor for Online Card Classes, and is a designer for Clearly Besotted Stamps in the UK. Debby’s light, airy designs are echoed in her photography, and we wanted to see just what the secret of those perfectly lit and beautifully staged photos were. Photography is a parallel passion for Debby alongside papercrafting, and her blog has some incredible photography resources you will want to look at after hearing what she has to say in that sweet accent of hers. Delightful! The light struggle is real, here in Alaska! I purchased a Foldio which helps me with my light issues! Loved all the ideas and tips. It would be great if you did a class for card photography. That’s an awesome idea! It’s something we all struggle with so a class would be fantastic. Great to hear the discussion on lighting and photos of cards. Thanks for sharing ladies! Great lighting/photography tips. Thanks! This is something I’ve been trying to get better at doing. The reason why I took up photography was actually Debbie… I just loved the way she takes pictures of her beautiful cards. I have a separate Pinterest folder called lime doodle just for her pics :) Thanks for the great tips! How wonderful to see all of you lovely ladies. The tips are priceless. Love the new web sight. Keep it coming. Cheers to y’all ! How delightful! You guys are a stitch! Thinking of Kristina and the Pack ‘n Play, or Jennifer editing her toes out of her card pics just made me laugh out loud! And so much good info on tripods, timers, etc! Thanks to all! Love the dialog and all the good tips! Thanks so much for your help ladies! I thoroughly enjoyed this video (and the other!). I sure hope you do more of these. Thank you!! OMG!!! I am loving Crafty Chat!!! It’s both informative and entertaining! Thank-you so much for taking the time to do this for us! It is truly appreciated! Debby, I feel like I have met you for the first time. How lovely to see you on video! I really appreciate all that you do. Chat with us more and make more videos. You are so good at it! Always love your amazing cards! And I love Crafty Chat! So much fun to see you all, and to continue to learn. You gals rock!! Hi, I watched the video today and cleared a space near my window and played around a bit with angles and I can already seen an improvement in my photographs. Thanks for the helpful and entertaining video. Love these chats. Great addition to the classes. I learned a lot and was so entertained. Thanks for sharing all these tips. I always struggle with taking photos of my cards and everything always looks darker than real life. I tried taking pictures next to the window, and they came out better. Great video! Great tips. I learned so much and it was fun hearing all the thoughts and viewpoints of everyone. I absolutely love these videos! I feel like I’m having a conversation with all of you! Great job! I love hearing the different perspectives shared in these discussions. A terrific fresh approach! Wonderful tips! Thank you Debby — love your cards and superb photography! Love this video. Debby’s cards and her photos are absolutely fabulous. Love the friendship I see between all of you. The photo tips are great. I definitely will try them. Fabulous…amazing advice that I want to try to put into action with my next picture! Thank you so much. The crafty chat series are a fabulous addition to the OCC site. I look forward to each episode. Besides realizing that you are actually human and not super heroes, you have such fantastic information to share. Thank you so much! Lots of useful information! Thank you very much! I would like to hear more about how to take good pictures when good natural light is not available/how to take good pics using a photo box. What a wonderful and informative discussion. I invested in a resonable photo box, but find my best photos are also in natural light. I set up on my dining room table with a tripod and use the wall of windows. I also feel a bit of a cloudy day makes the best color. Shimmer, glitter and sparkle can be challenging. Debby is an absolute genius with her creativity and her photos. I would love to see another chat with her telling us about her card making process, where she gets her inspiration from, as well as how her process for choosing those gorgeous color combinations. I can’t find the video for this episode. Did it get removed? Hmm… so strange! Sorry about that. It should be up there now. I cannot open this, I’m not impressed as I’ve just purchased this! Hi Diana! This is not a purchased class. 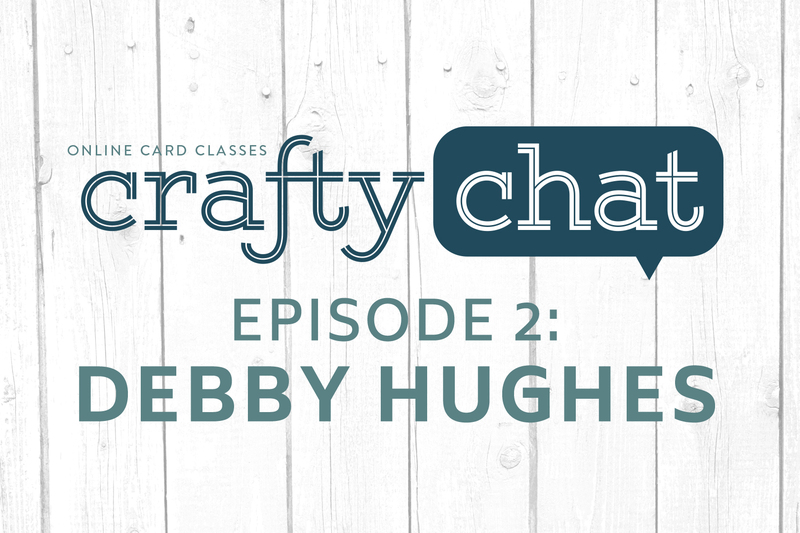 Crafty Chats are free videos on the Online Card Classes blog. (The video disappeared for some reason, but it’s back now). To see classes you’ve purchased, go to your MY ACCOUNT page (link at the top of any page), and then click on the title of the class you’ve purchased. The class content will display on the right. The OCC blog post show as default until you click on the class name. This chat was fabulous. I laughed at Jennifer and her crazy photographing habit. Mine is crazy too. I often take a kitchen chair, which is tall for the island, out to the deck and put it on top of the patio table, throw a table cloth over it and use that as my area to take pictures in natural light. Sometimes I wonder if my neighbors think I’m nuts! I got so many wonderful ideas from this chat, thanks so much ladies! Loved it. I’m so excited to take a picture in natural light now and see how different it is from my usual card pictures. Such an awesome chat! Love how you began Debbie…my story is similar too! Your photography has influenced me greatly, as has yours Kristina. Seeing your wrapping paper, I have also started looking at sheets of paper as backgrounds. I am a photography enthusiast as is my son, so, I made a light tent (out of a card board box) for myself and bought a couple of lights. I make a few cards and then set up the tent put the card in it and take the photos. I love how the photos look. Very often, though, I take photos with my iphone..its just quicker! Loved this chat! will be coming back for more!! OMG new use of the pack’n’plays my kids are using! So glad that Jennifer nagged her to create videos, I just love everything she does! Thanks so much for all the tips! Most of the time I am still spending as much time on the photograph as I did on the card. I am learning but it’s still slow going. I found things improved some months back when I read the tip about using a timer. I am still using the cardstock backdrop but it’s driving me crazy. I loved the reflector tip…going to try that! Sadly we have terrible lighting in this house (very nearly a cave lol) so I am currently using a light box but the lighting is rather cold. I have been admiring Debby’s cards and photos for awhile now so it was fun to watch this chat video! A big thank you to all of you for your endless inspiration. Love all you do, Jennifer. Your videos are so well done and even though I’ve been making cards for 13 years…I still learn things from you. This chat has been awesome… I use my IPhone.